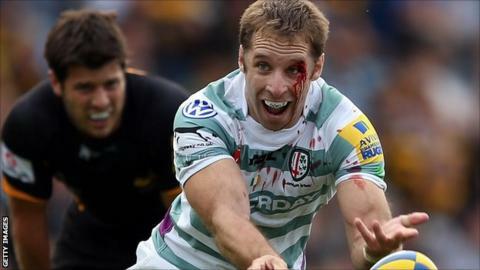 London Irish scrum-half Tomas O'Leary has called for calm and has urged supporters not to panic after their poor start to the new season. Irish have won just once this season and are 11th in the Premiership table with four points from five games. Friday's 35-11 defeat was their latest loss with Brian Smith's side taking on Northampton at the weekend. "It's a long old season and there is no point panicking just yet," O'Leary told BBC Radio Berkshire. O'Leary, who joined the Exiles from Munster in the summer, admitted to being shocked at his new side's start, but believes they can turn things around. "If it does keep going the same way then fair enough," he said. "But I think as a team we will turn it around and hopefully we can give the supporters something to cheer about. "You don't envisage losing three or four games at the start but I knew it was going to be a tough challenge and I guess that's what I signed up for. It's testing time for everyone, no-one likes to be in this position." Director of rugby Smith himself acknowledges it has been a poor start from his side, but has echoed O'Leary's sentiments and has urged them to come through this tough patch. "It's not the sort of thing when you close your eyes you dream about," he said. "If you are an aspiring player or coach you always dream of holding up trophies. But this is part of the game, we'll be a lot stronger for going through this patch. Smith added: "This is the journey we have to take and we have to come through it and I am sure we will. The most important thing is to focus on the things you can control and if you do that then we will be alright. "It's a great test of character when you are going through adversity. They are frustrated and desperate for a result and I am sure they will play their hearts out this weekend."